Cats are one of the most popular pets in American homes these days. They’re very loving pets and capable of providing you years of companionship. Just like any other animal or pet for that matter, cats sometimes get sick. There are several different types of ailments that cats get and one of those is diabetes. Yes, cats can also have diabetes. Also known as “Feline diabetes”, but Diabetes nonetheless is a serious disease in cats just as it is in humans, although it can be treated by a veterinarian. Diabetes is more commonly found in humans than with cats or other animals because humans consume large amounts of sugar (glucose) unlike their feline counterparts. The level of blood glucose in the animal is kept under control by insulin, which is produced by the pancreas. When the pancreas doesn’t produce enough insulin, diabetes is to culprit. The symptoms of diabetes in your feline friend may vary. The most common symptoms include an increase in urination and an increased thirst. a coat that is lacking it’s normal luster often found on healthy cats. An increase in thirst is easy to detect, as you can easily notice the water dish empty throughout the day. If your cat has feline diabetes, you”ll need to feed them at the same time each day. You should also prevent your cat from going outside as well so that you can closely monitor what they are consuming. 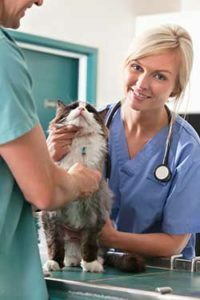 After taking your feline to the veterinarian, if determined that the cat does in fact have diabetes, your veterinarian may prescribe insulin which you’ll need to give to your cat once or twice or a day. Your veterinarian will tell you how many shots and how many units of insulin you’ll need to give your cat every day. Always follow the recommendations provided by your veterinarian. Before giving your cat an insulin shot, always make sure that they’ve eaten some food first. Just like humans, if you give your cat insulin without any food already in their system, they may go into a “Hypoglycemic Shock” which occurs when there is too much insulin in the cat’s system. A hypoglycemic shock is very dangerous as it can become fatal and should be avoided at all costs. If you have to give insulin shots to your cat because of diabetes make sure to keep an eye on them after you’ve administered the shot to ensure they are ok. After your cat’s been on insulin for a period of time, your veterinarian may reduce the amount of insulin you’ll need to inject. Even though your cat may need to be on insulin the rest of their life, they’ll lead an otherwise normal healthy life as a feline.